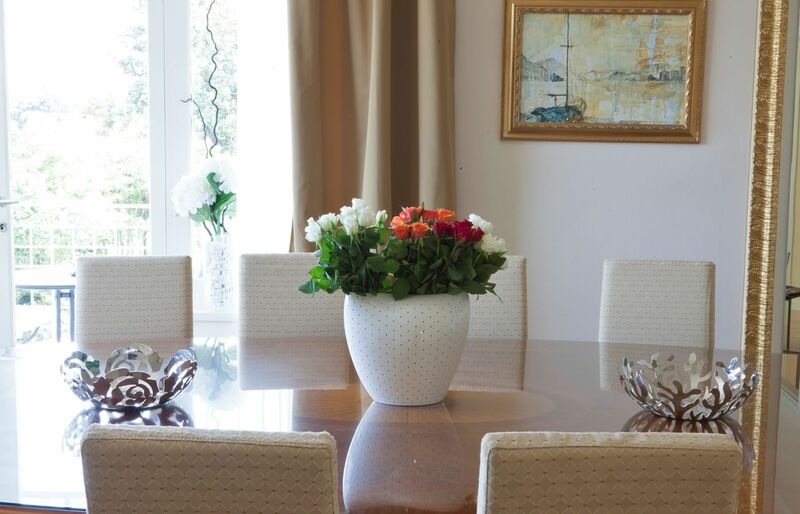 Villa Ermelinda is divided in three floors and has the typical structure of the mansions from the 40's. 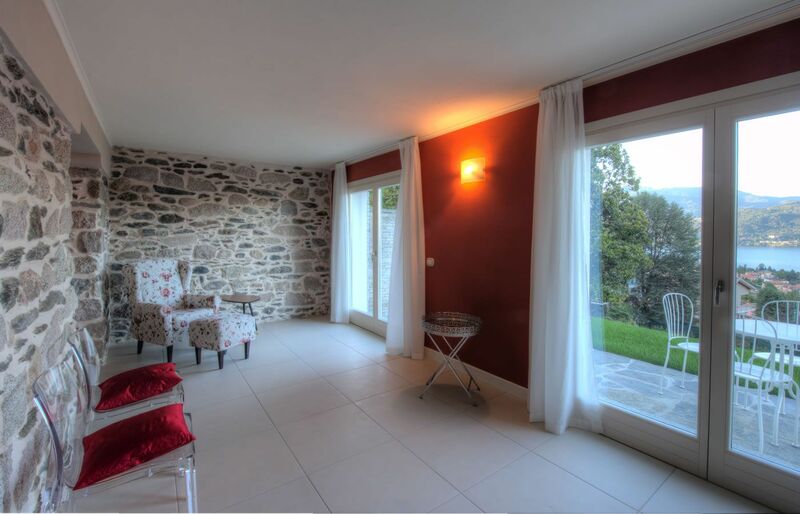 What makes it unique are the carefully renovated big windows that, dominating all the rooms, allow you to enjoy a breathtaking view of the Lake. 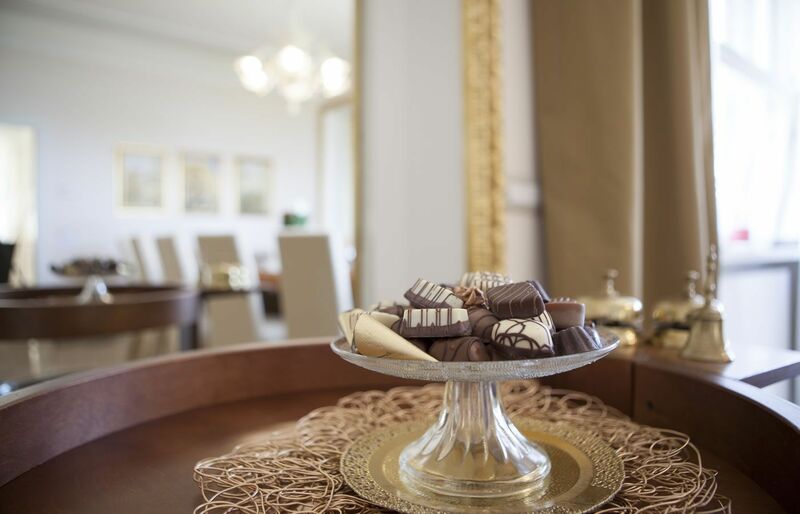 The Villa is furnished following a sober, elegant and refined style, with notes of vintage and all the rooms are embellished with oil-paintings and watercolors made by a local artist. The sleeping area is located on the upper floor of the Villa which is accessible by a majestic wooden staircase, completely restored and enhanced during the renovation. The floor is paved with solid oak wood, and it's equipped with modern heating and air conditioning. 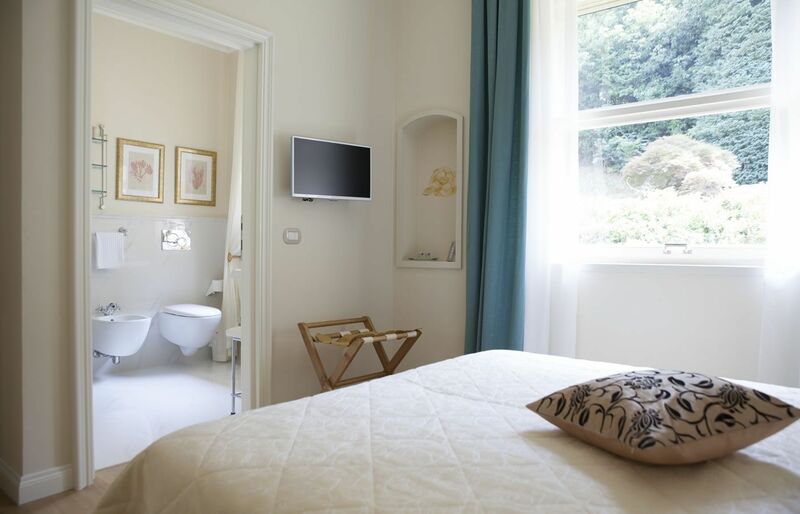 There are five rooms, all furnished keeping high standards of quality and comfort: every room is equipped with elegant curtains, built-in wardrobe, refined upholstered bed and Television, other than a private marble bathroom with shower bidet and luxurious finishings. Magnolia Room. The historical master bedroom. 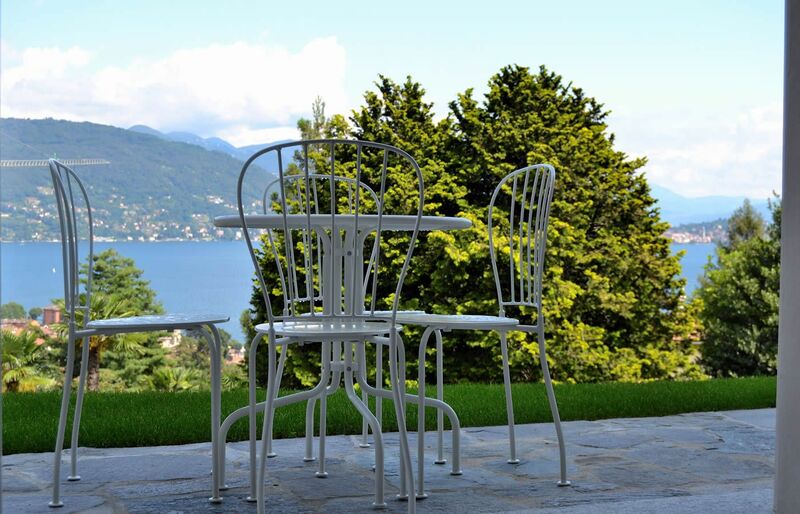 It is characterized by two big windows over a privileged view of the Lake and of the pool. The prevalent color is ancient-pink that associate the curtains and the wall of the bed, and its bathroom is made of travertine marble. Ninfea Room. It's the only bedroom with a balcony that overlooks the pool and it has a view of the lake. 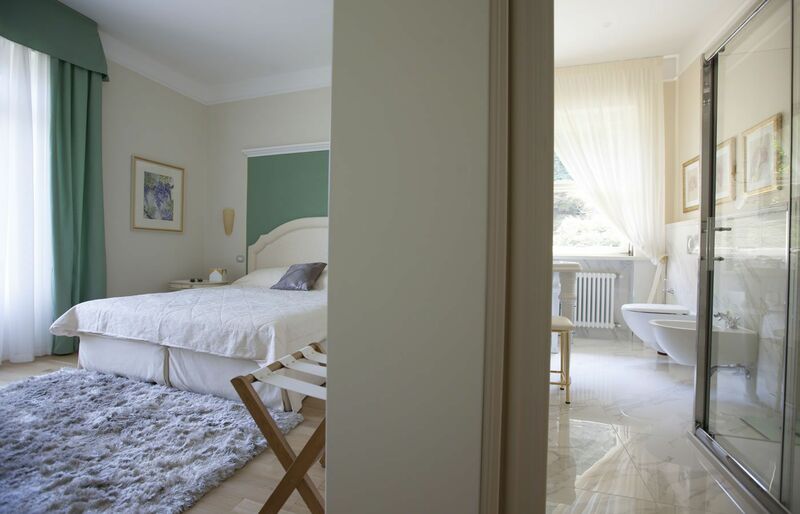 The prevalent color is turquoise green, it has a twin bed and its bathroom is made of white Carrara marble. It is accessible by a small entrance with a built-in wardrobe and it is equipped with big TV screen on the wall in front of the bed. Peonia Room. 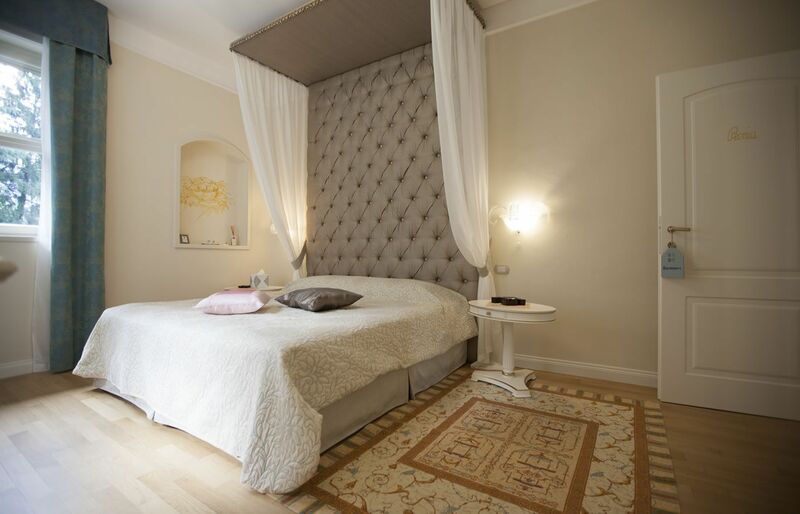 Even if it does not have the view over the Lake but is oriented towards the park, it is the most luxurious room of the entire Villa: it is furnished with an elegant poster-bed entirely covered with silk. 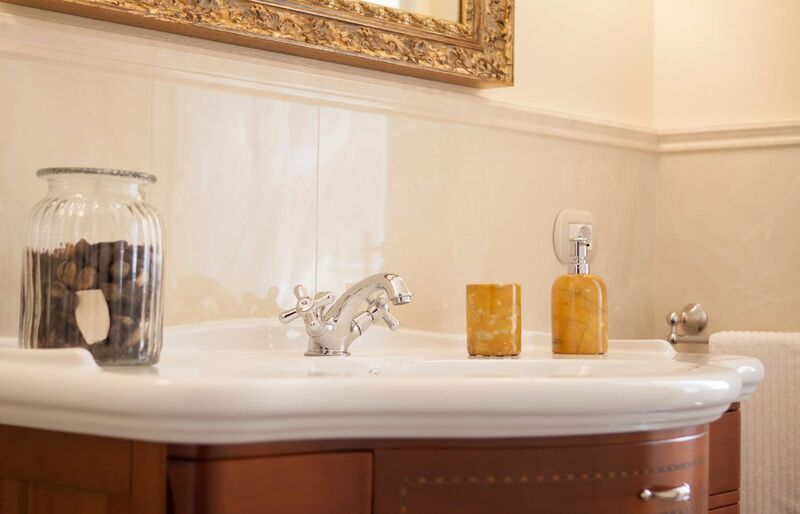 The bathroom is made of dark grey marble and the prevalent color is dove-grey. Gardenia Room. 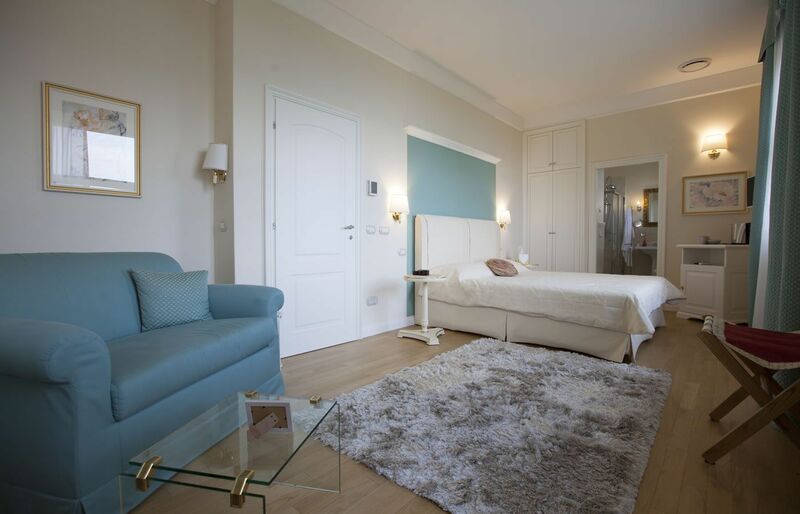 It is considered as the suite of the Villa: it is the widest room, with twin beds and a small living room with an elegant sofa that, if needed, becomes a third bed. The suite is in front of the lake, it has two big windows and its predominant color is powder-blue. 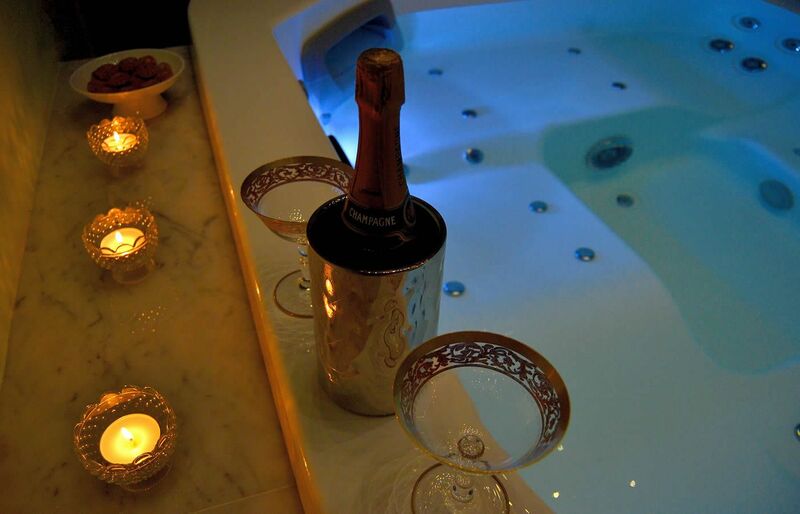 The bathroom is covered with royal marble. Camelia Room. 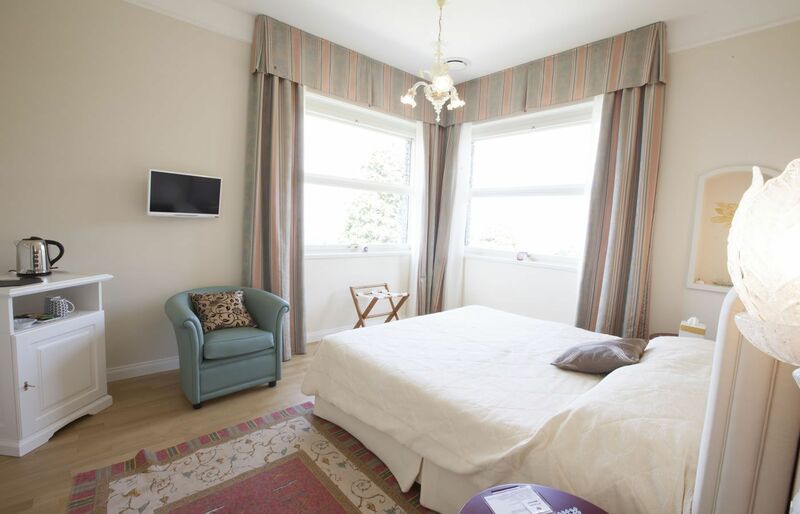 It is the smallest room, with twin beds and a beautiful view over the park. The characterizing color is green, while the bathroom is made of absolute white marble. 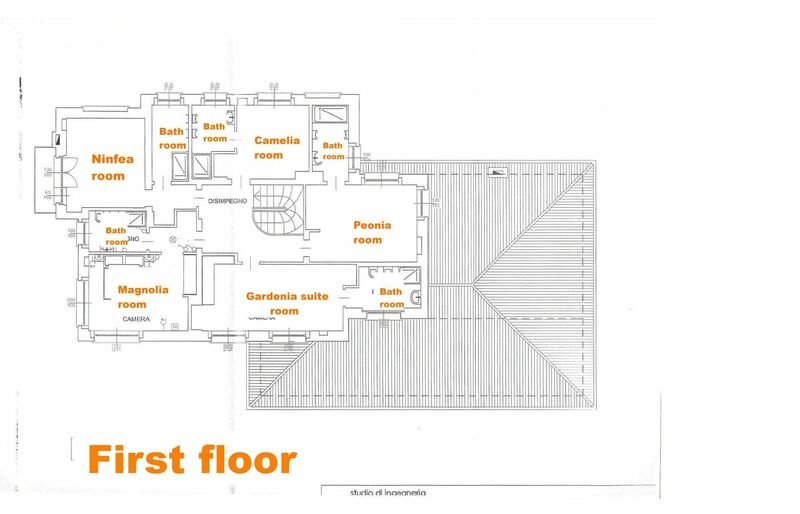 Upon request, a sixth bedroom can be available on the living floor, converting the TV relax room in a sofa double bedroom and using the adjacent bathroom (with shower and wardrobe) of the living area. 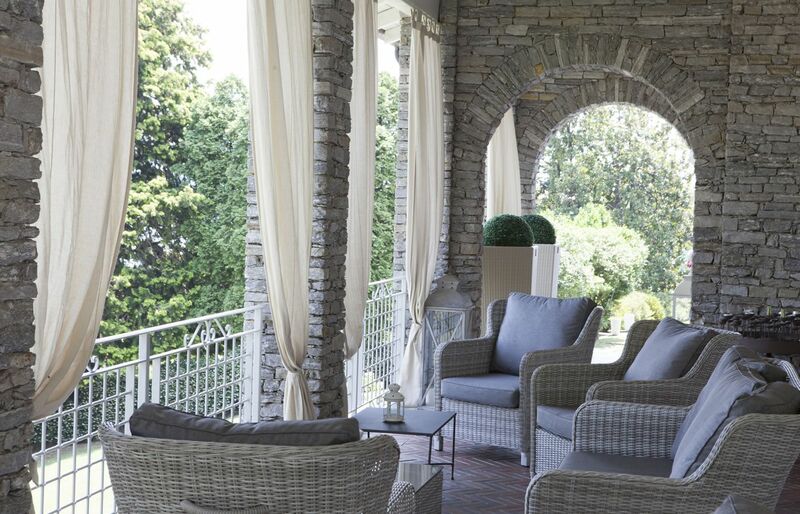 The living area is sited on the ground floor and it is entirely paved in polished roman travertine. 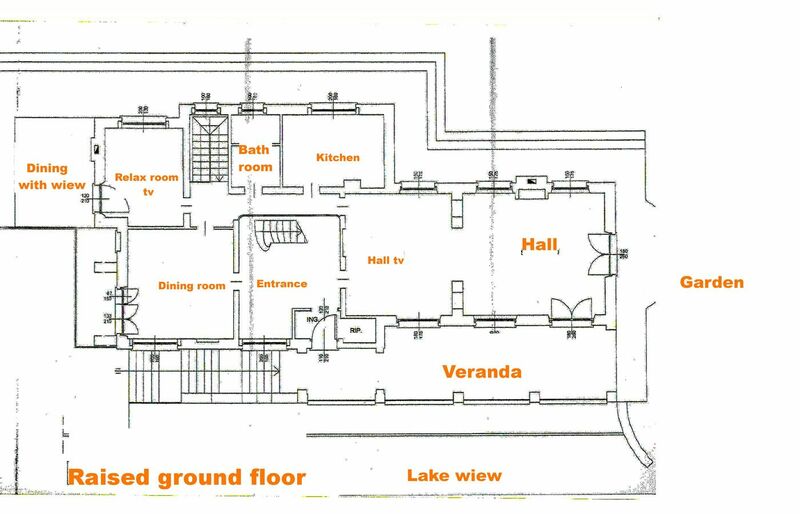 The core of the floor is the big hall, facing its own private garden which is furnished with an outside living room covered by an elegant white voile, and facing a wide veranda with drapes and a view of the lake, furnished with a wrought iron living room. The guests can relax on the white leather Chesterfield sofas that surround the Alps-green marble fireplace, they can enjoy one of the many liquors that are contained inside an elegant black leather vintage cocktail cabinet, they can engage in a chess game over the old card table, or maybe lay down to watch some TV on the adjacent living room. 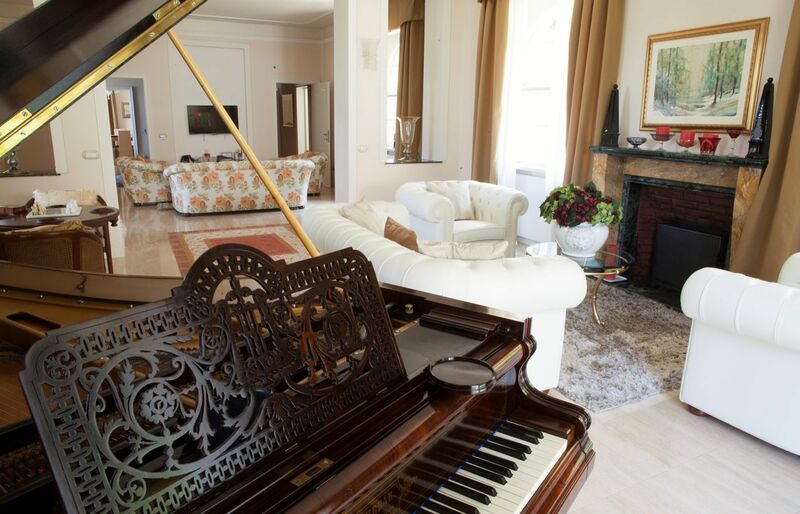 The hall is embellished with an old Austrian grand piano, completely renovated and functioning. 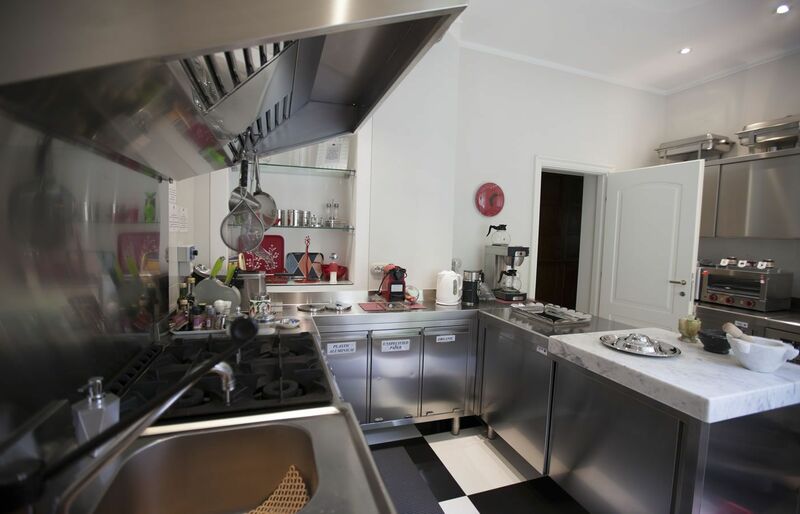 From the hall it is possible to enter, through a corridor, in a kitchen made of stainless steel equipped with professional tools, and also with a wide window overlooking the park. 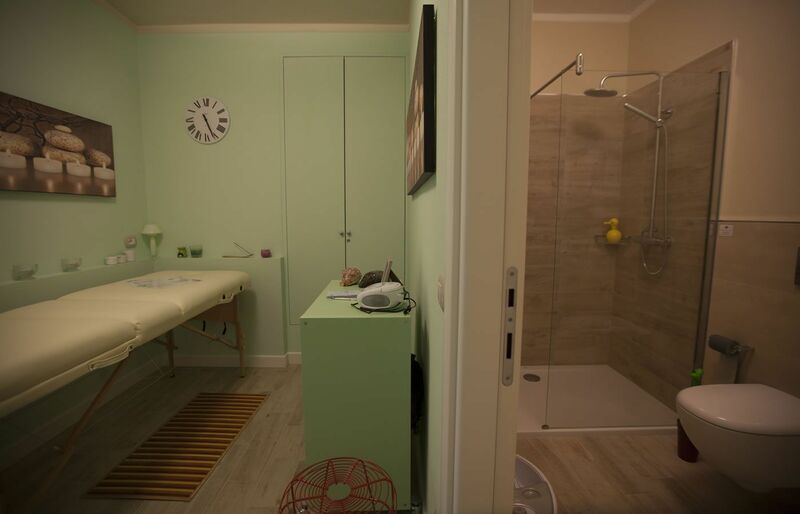 Proceeding through the corridor we reach an elegant ante-room and then a small bathroom with shower. 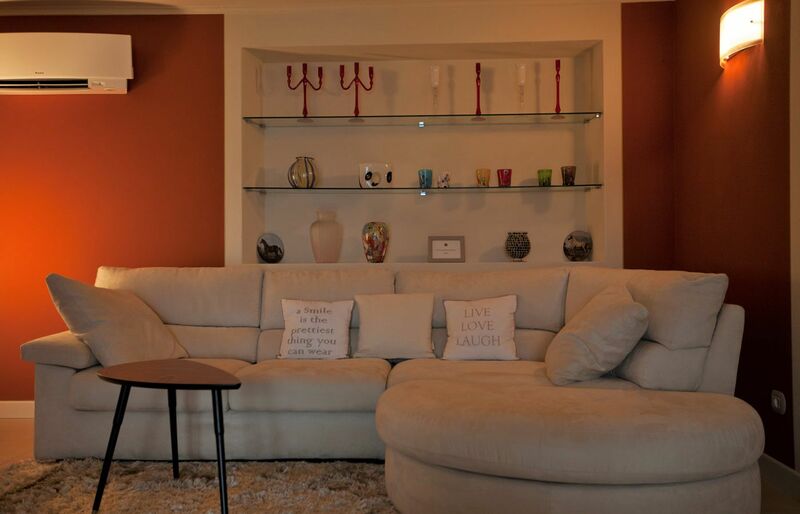 Finally we can find the relax room, with TV and sofa, that, if necessary, becomes the sixth bedroom with sofa double bed. This room overlooks the arbor with transparent glass roof, equipped with table and barbeque grill, where it is possible to grill meat or fish, having lunch next to the swimming pool and enjoying the view over the Lake. The arbor is linked to a small balcony belonging to the dining room, also accessible from the entrance hall. It overlooks the Lake and it is furnished with precious cherry wood furnishes, an elegant table and chandeliers in Murano glass. 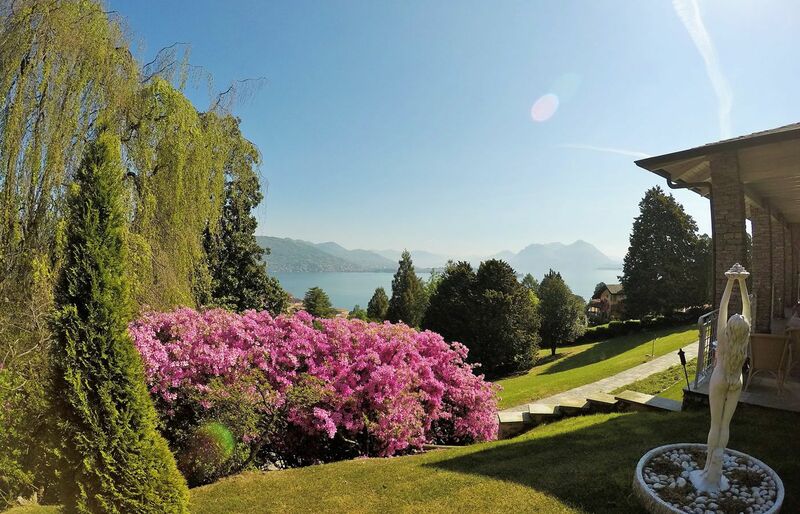 The wellness area occupies all the basement floor and it is accessible directly from the garden, through four big French windows, or from the travertine stairwell descending from the living area, embellished by numerous watercolors depicting glimpses of Lake Maggiore's landscapes. 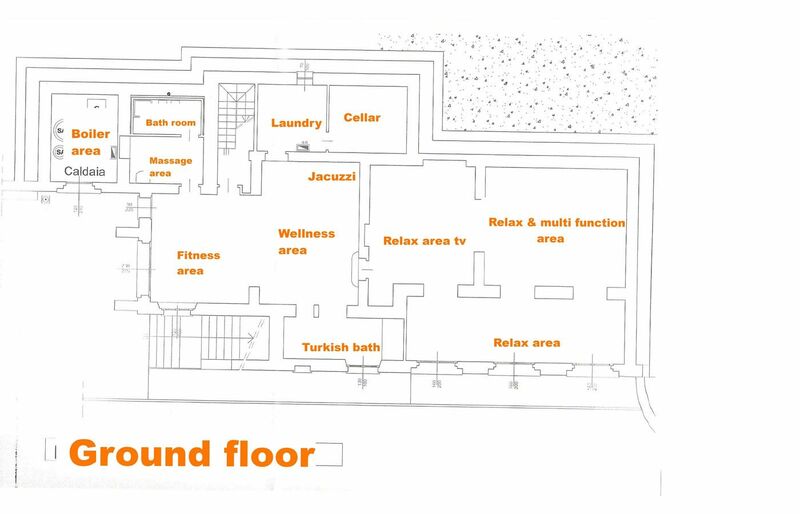 Here our guests can relax inside the jacuzzi or the Turkish bath and they can workout with professional gym equipment, then rest over comfortable relax beds or sip herbal tea prepared in the herbal tea corner. Upon request it is possible to book massages of any kind. 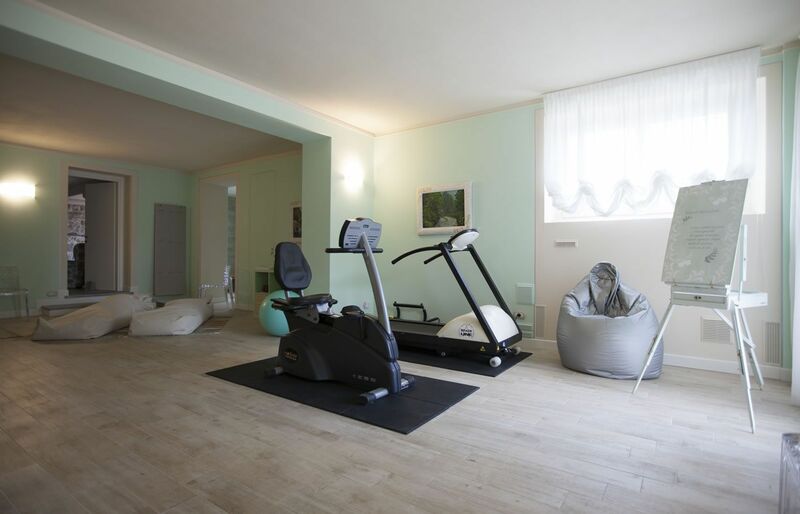 The fitness area is equipped with its own private bathroom with shower and with the laundry room, equipped with washing machine, dryer and electric iron. 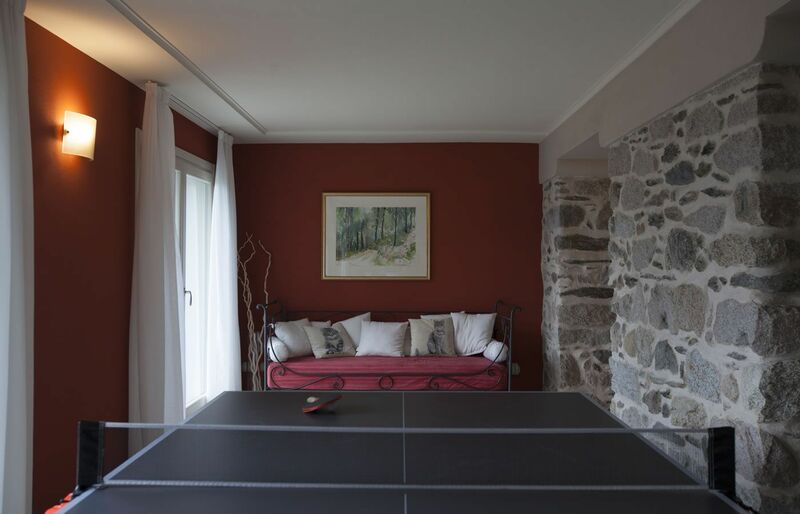 Just next to the wellness area a multifunction space has been designed with walls of natural stone, TV, several sofas, armchairs and an impressive refectory table, previously belonged to the former owners of the Villa. Also from this room a beautiful view of the lake is guaranteed with direct access to the garden, through three big French windows made of glass. The garden and the swimming pool. The park is laid over several levels that alternates from the entrance gate up to the pine forest. Following the entrance alley, at the first curve there is the access at a wide terraced garage and then, going on, the square made of stone, next to the entry staircase of the Villa. The swimming pool has been designed in a privileged position, over a terracing on the ground floor level, which allows to enjoy the Lake view while swimming. The lawn around the pool is garnished with elegant iron deckchairs, sunshades, shower and an old table made of stone useful to drink something under the shades of the trees. From the swimming pool starts an old stone staircase that runs through all the following terraces until reaching the last floor before the pine forest: from here the view is breathtaking and it is possible to take a walk to discover the tranquility of the pine forest. select service *BedroomsCleaningGiftsFunWellness&FitnessOutdoorOther servicesSome suggestions..